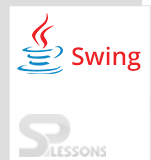 By using Swing Form, developers can build stand alone applications, many developers will use Swing because it consists of more components compared to the AWT. In real time developing Swing Form applications user needs to have database also. For instance to register into the log in page user have to enter his details like user name and password, etc .To store the user data admin needs a database, these type of dynamic application will be use full in restaurants to generate the bill to customer because they can not use more affordable applications like high configure application made up with various technologies needs big database. 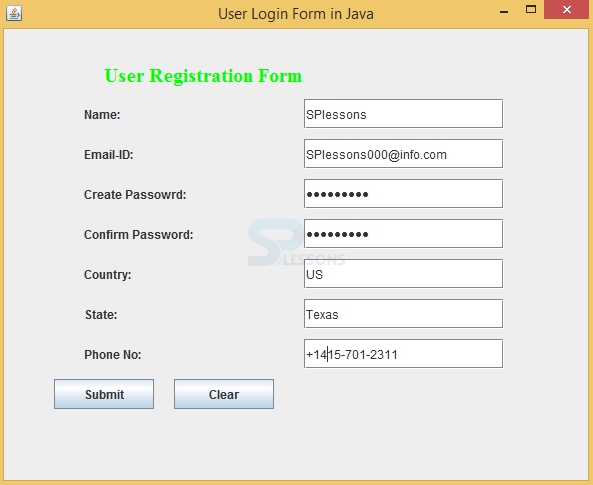 The following example shows how user can register into the log in form and what is the back work of the log in page after submitting the details of the customer. Create head message of an application, add the color and font text. Create Submit button and Clear button and ActionListener to the buttons. Declare the components of a frame in default constructor. After entering the details data will be saved, other wise it displays password does not match. After entering the details of an user in the form,output will be as follows. Swing Form – Developing of static applications and dynamic applications are possible with Swing. Swing Login Form – To develop the real time applications data base is needed in swing also.